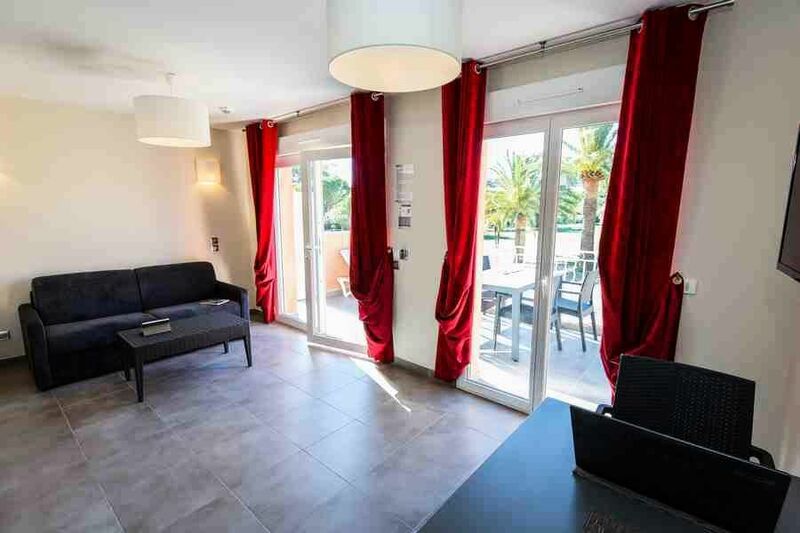 Located in the town of Grimaud, just 2 minutes from Port Grimaud, Residence Les Perles St Tropez **** is ideal for family holidays. 200m from the beach, it stands in the heart of a landscaped park of 4 hectares. The residence has 45 air-conditioned apartments and every comfort. It is equipped with an outdoor swimming pool (unheated) with solarium open from mid-April to mid-September. It is also equipped with a golf course and tennis courts (activity fee). Rental bikes are available to discover the surroundings. Leisure activities nearby: golf, water sports, sea fishing, hiking, mountain biking, etc. Living room: sofa bed for 2 people - 2 bedrooms with 2 single beds - 2 bathrooms with shower - separate WC - Fully equipped kitchen area. City center access: 2 minutes by car. Guest Pets Allowed: Included - only one pet per accommodation, not allowed in common areas. Deposit (in supplement): From 300 € by apartment, to pay on your arrival and returnable the day of your departure after inventory. Golf: In addition - Golf Pitch & Putt 7 holes. Baby Kit: Free - with reservation with accommodation. Final cleaning: Optional end-of-stay cleaning service to be booked in advance or done yourself on departure. Bicycle rental available: Yes, at an extra charge - prices and payment on site. Restaurant: Yes, 50 meters from the residence. Tourist tax (surcharge): To be paid on site, see the current rate. Tennis: In addition - 2 tennis courts.